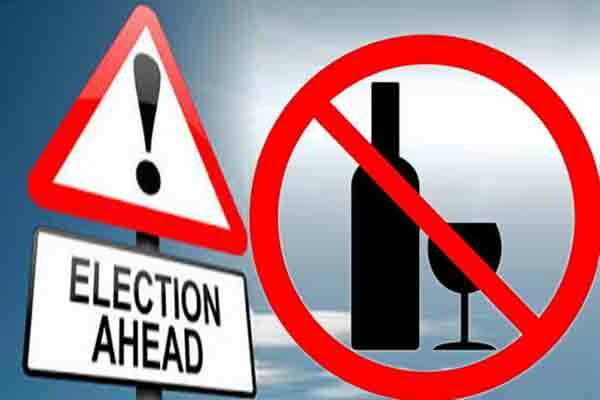 The district administration of Dima Hasao has issued an order stating that in view of the general elections to the Lok Sabha 2019 on April 18, forty eight hours ending with the hours for the conclusion of poll from 5 pm of April 16 next to 5 pm of April 18 have been declared as dry day. Any violation of the order will be dealt with under the relevant provision of Assam Exercise Act and rules, stated a government press communique. Similarly, the day of counting of votes which is fixed on May 23 next, sale of liquor etc are prohibited and declared as dry day till the process of counting is over. It has also been declared that possession of any intoxicants by any person or group of persons and total ban on sale of liquor, giving or distribution of spirituous, fermented or intoxicating liquor or other substance of alike nature at hotel, public eating house, tavern, shop or any other places, public or private during the period is prohibited. All bonded warehouses, IMFL off/on shops including club on, hotel-on and country spirit shops will remain closed during the dry days. It has also been stated that restriction provided in the excise law on the storage of liquor by the individual and unlicensed premises shall be vigorously enforced. Just three days left for the polling in the seocnd phase of the Lok Sabha polls, the district administration of Dima Hasao has geared up so that the general election is held in the district in a free and fair manner.